We have mentioned Gites de France, the excellent French system of B&Bs before and we recently used the website to find accommodation. We went to Burgundy on Tuesday to see relatives who were driving through and took the chance to spend a couple of days there. 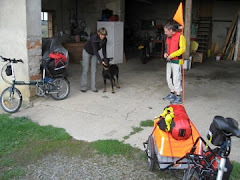 We both enjoy cycling in France, because it is a fairly empty country apart from the major conurbations. There are lots and lots of very quiet roads rather than the cycle routes the Germans go in for. We can use the white roads on the 1:100 000 IGN maps in France and in addition these excellent maps for cyclists and walkers show a number of byways. These are often unsealed, but can be used by anyone apart from racing bike riders. Visiting France is good for us as well because we are studying French at present at the local Volkshochschule. On this trip we booked into a chambre d'hote with table d'hote in a village near Beaune. We had a jolly time before dinner catching up on the events of the past few months over a bottle of Burgundy and practising our French over the excellent dinner putting the world to right. The advantage of table d'hote is that one eats with the family and needs to talk French. The family in this case was a single lady and two dogs. The dogs said but little. They were incredibly well behaved. The house had two guest rooms and had a large garden with a swimming pool. The house backs onto a small sports field. It is near the church. There is no restaurant in the village. We can recommend it for an overnight stay or for a few days.